A new superpower, with the largest population and GDP on the globe, there are now fears that China is becoming more assertive. China expert Kerry Brown guided students through China’s foreign policy, from its skirmishes with US Navy destroyers in the South China Sea to its arguments with Japan over the Senkaku/Diaoyu Islands and its increased displays of military prowess, including huge investments in cyber warfare. Brown also assessed China’s extraordinary plan to create a `New Silk Road’ across Central Asia, which is one of the biggest infrastructure projects in modern history. In doing so, he addressed the simple question: What does China want? The answer lies in the unique way China thinks about the world. 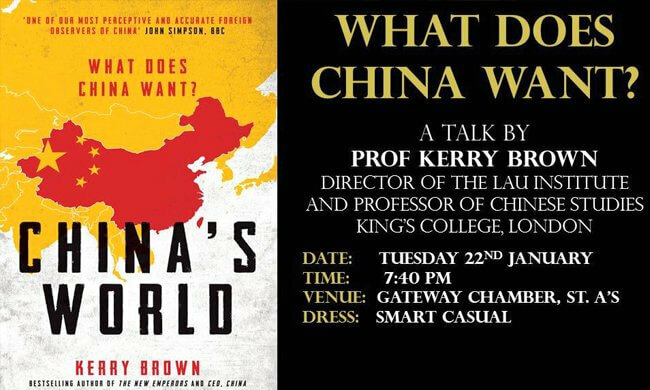 King’s were privileged to hear analysis of this by one of the world’s most recognised and respected authorities, and based upon unparalleled research into Chinese leaders, their beliefs and their instincts. What is clear is that in the next decade China’s actions on the world stage will affect us all. The talk was followed by a particularly vigorous, nuanced and wide ranging question and answer session. Kerry Brown was Professor of Chinese Politics and Director of the China Studies Centre at the University of Sydney, Australia (2012–15); Senior Fellow and Head of the Asia Programme at Chatham House (2006–12);First Secretary at the British Embassy in Beijing and then Head of the Indonesia, Philippine and East Timor Section (1998–2005). He directed the Europe China Research and Advice Network (ECRAN) between 2011 and 2014. His most recent books are: The Rise of Xi Jinping (2016), China’s World (2017), The World According to Xi (2018) and China’s Dream: The Culture of Chinese Communism and the Secret Sources of its Power (2018).